These boards are designed for use in flat water blasting/ jumping , all waves riding in a wide range of conditions. 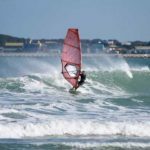 This enables the 2018 Gangsters to be early planing , very fast but with great turning and control in a wide range of wave riding conditions. Available in a Tri fin / Single fin set up with US or Slotbox front fin options and US box onlyback fin options. Available in both our CKC [ Carbon /kevlar/ Corecell] and [CIC Carbon/ Innegra/ Corecell ] constructions and Standard or custom graphics.